"I just wanted to say thank you for everything, the whole wedding was great. "Barbara thank you so much - that was beautiful. Your voice sounded so lovely when you did the ceremony - and especially when you read the poem"
"You were terrific. Thank you so much for all that you did for us"
"Barbara, I only received positive comments about you. I felt pretty relaxed during the ceremony and I feel this was mainly because of you"
"The ceremony was perfect - it was exactly what we wanted"
"You really cared about us and showed a love for our family." 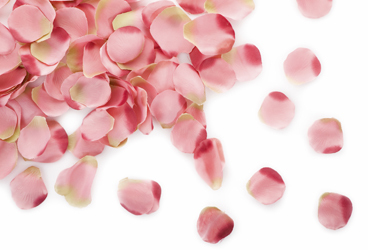 "Our ceremony was beautiful - we want to thank you for being so approachable and easy-going." "We would like to thank you for marrying us. It was a very happy day for both of us and the ceremony was exactly what we wanted. It was a pleasure to meet your husband. " 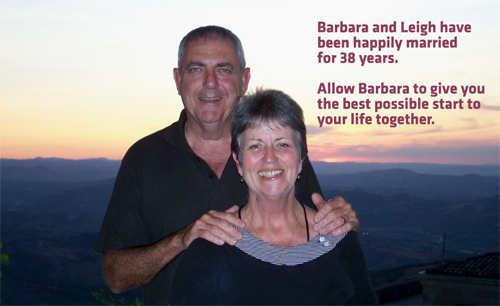 "Thank you Barbara for helping to make our wedding day a day to remember. Your very professional (yet casual and calming) manner made this special day one which is never forgotten." "The wedding day was all we had dreamed of.....perfect. the whole marriage process and for such enthusiasm with making our handfasting ceremony come alive. Your contribution to our day made it perfect". "I have been to a lot of weddings and mine was the best thanks to you Barbara!" "Married at last. Thank you so much Barbara for making our lives complete." "It was perfect (even with the rain!) and you were the perfect choice for us. "Barbara thankyou for helping us have the most amazing wedding ceremony." "The day was everything we wanted and more. We are blessed to have met you." "Happily married, because of you." "Our wedding ceremony was everything we ever wanted and much more." "Because of you our day was perfect Barbara"
"Thank you so much Barbara. The ceremony was just what we wanted". at ease with the whole process." you were our lady for our day". so special and easy. Thanks heaps again". planned but the ceremony was just beautiful thanks Barbara". you as our celebrant, we will highly recommend you". "You were absolutely fantastic and we both had a fabulous day. liked the ceremony, so thank you so much for everything". our lives together. Thank you so much". "Words can't describe how happy Brad and I are we chose you as our Celebrant. Everything ran so smoothly and trouble free thanks to all the effort you put in. You made the whole experience enjoyable and stress free, thank you so much". how nicely you conducted the ceremony". "A big thank you for Saturday. It was a very beautiful ceremony". "Thank you again for a beautiful day. When the celebrant that we had booked had to cancel two months before the wedding, you were only too happy to step in and reorganize the wedding ceremony with minimal disruptions to our couple. Your professionalism and caring attitude was apparent throughout the planning stages and also on the day. We have no hesitation in recommending you to any Bride for their upcoming wedding and look forward to working with you again." "The ceremony was amazing Barbara. It was everything we 'd wished for". "Thank you so much for making our day so special. Your professionalism before and during the ceremony was impeccable". "You did an awesome job Barb. Could not have asked for a better day or a better Celebrant." "You made the ceremony into such an emotional one. We truly recommend to anyone to have you for their wedding Celebrant." so intimate, relaxed and fun. who may require your services". have been more pleased with how the ceremony went."